The recent Pacific Northwest BI Summit proved to be fertile ground for discussing the impact of SaaS, open source for business intelligence, IT appliances, unstructured data and operational BI. The annual Pacific Northwest BI Summit, organized by Scott Humphrey, is the event I always look forward to each year because it provides a unique opportunity to get together with my peers in a relaxed atmosphere to discuss current trends in the business intelligence (BI) and data integration industry. The 2007 Summit, which ran at the end of July, provided both interesting insights and lively debates about business intelligence directions. At the more formal morning sessions, Claudia Imhoff covered software as a service, Jill Dyché looked at aligning IT and the business, and William McKnight explained the role of RFID technology in business intelligence. I led a discussion on IT appliances. It’s the informal discussions in the beautiful setting of the Rogue River, however, that often provide the more lively discussions and debates. My goal in this article is to cover some of the key thoughts coming out of the event and to add my own commentary as I go along. To provide a framework of the various topics discussed, I have included a figure that illustrates some of the key BI trends that we should be tracking and thinking about (see Figure 1). The three potential areas where SaaS can be offered for business intelligence are: business intelligence and data integration software tools, analytical application solutions, and information as a service. Of the three, many people at the Summit felt the application solution area was the one that held the most promise, particularly for companies with smaller IT organizations. The advantage of SaaS for many companies is that it enables them to deploy solutions faster and often at a lower cost. The leading example of SaaS for operational processing is Salesforce.com, and there are already several companies offering BI decision-processing solutions for this service. The downside of any SaaS application, like any application package, is that the customer is often locked into the application solution and that encourages the creation of application and information silos. Open source is gaining momentum, and there are significant amounts of money coming from the investment community into “open source” vendors. Open source approaches benefit both customers and vendors. For the customer, the benefit is lower software costs. The downside, however, can be higher development costs. Open source solutions are particularly beneficial to those customers who are willing to trade development time for reduced software costs. Another advantage of open source solutions is that they are often designed for lightweight Web deployment, and they don’t have the legacy of the “bloatware” and older architecture of products from the large BI software vendors. For vendors, the benefit of open source is they don’t have the overhead of a large direct sales and marketing force. Also, for those vendors with a solid user community, the community can help reduce development and support costs. Several people at the Summit commented that the open source vendors are more worried about the acceptance of the open source approach than customers are. For many IT organizations, open source products are simply considered alongside full commercial approaches, and standard selection criteria are applied to both. As we move forward, it will be common practice for organizations to use a mixture of commercial and open source products. The conclusions at the Summit concerning IT appliances were that the number of vendors entering the market is steadily increasing, and there is not room for everyone. It was also felt that a market strategy of simply selling price/performance does not have long term viability. The vendors that are likely to endure are those that offer business application-driven appliances, or who OEM their appliances to applications vendors who package their offerings with the appliance. The comments on both SaaS and appliances suggest that there is a healthy market for application-driven BI solutions that run in either an external SaaS or an internal appliance environment. The risk, as has already been mentioned, is creation of application and information silos. There was a lot of discussion at the Summit about the use of unstructured and semi-structured data in business intelligence. 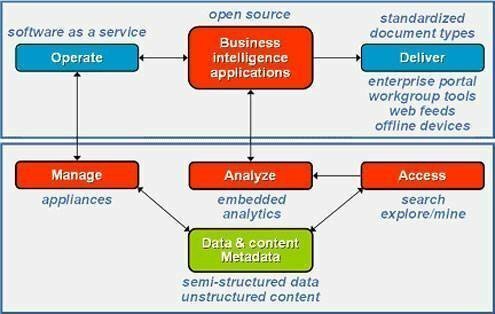 Given the amount of business content that exists both inside and outside an organization, it is becoming increasingly important to convert this unstructured content into a semi-structured form (usually XML) that can be used in conjunction with structured data for decision making. External web data, for example, is particularly useful for market and competitive intelligence. Another approach to handling and processing business content is to employ search technology to access both unstructured content as well as existing corporate data. Enterprise search vendors are now entering the BI market and will begin to create some serious competition for BI vendors. The solution for BI vendors is to acquire search technology, build their own search solutions, or create strong OEM development relationships with search vendors. An important growth area related to business content and search is the use of data exploration and text mining technologies. Everyone agreed that operational business intelligence is one of the fastest growing areas of BI because it can provide quick business payback by solving specific operational business issues. It also has the benefit that it can be deployed to a larger group of users in the organization. One of the key directions in operational BI is to embed analytical processing into operational business process workflows for tasks such as customer segmentation, risk analysis, fraud detection, and so forth. This style of processing will encourage increased use of data exploration and mining technology, which is becoming easier to use. There was general agreement at the Summit that many existing BI tools are bloated with functionality that many users simply don’t need and find difficult to use. The big growth area in business intelligence is therefore likely to come from solutions that improve ease of use and self service, and offer light Web deployment models. Many of the advances in this area are coming from small start-up BI vendors. Once again the Pacific Northwest BI Summit was a wonderful experience and provided an excellent opportunity to share views and gain insight into what vendors and other consultants feel is the likely direction of the market. The consensus from the meeting was that the technologies discussed here and outlined in Figure 1 will continue to evolve over the next twelve months and will become increasingly important to the decision-making process. As a closing thought, it was noted that some key business intelligence vendors are ripe for acquisition, namely, Business Objects, Cognos, Informatica and Teradata, and that at least one of these will acquired by the next Summit. We will see next year!